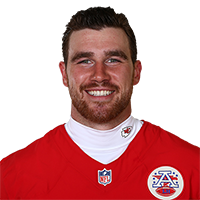 Published: Jan. 20, 2019 at 08:18 p.m.
Kansas City Chiefs tight end Travis Kelce puts the Chiefs on the board with an impressive 12-yard dart from quarterback Patrick Mahomes. Published: Jan. 12, 2019 at 06:30 p.m.
Kansas City Chiefs quarterback Patrick Mahomes' slick sidearm throw hits tight end Travis Kelce for 15 yards. Published: Dec. 9, 2018 at 02:18 p.m.
Kansas City Chiefs running back Patrick Mahomes drops it in the bucket to tight end Travis Kelce for 15-yard touchdown. Published: Dec. 2, 2018 at 06:40 p.m.